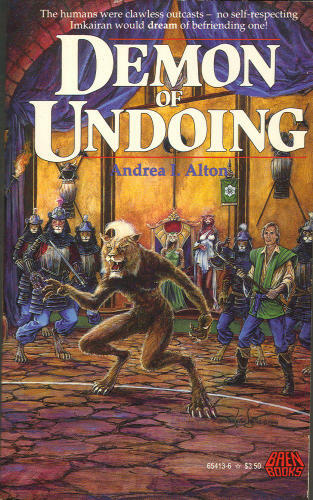 A while back I read a novel called "Demon of Undoing," at first glance a sword-and-sorcery-type thing that is later revealed to be taking place on an alien planet called Imkaira, which is at a medieval stage of development. The "demon" of the title is a stranded human explorer. The alien society was described in considerable detail, including the symbols of its various feudal clans--the arms of several are given. I wouldn't recommend the book--it read like a middling imitation of C.J.Cherryh, whom I don't like either. It was also the worst-proofread example of printed matter I have ever come across, on par with the average 6th-grade book report. "Above the tallest mast hung a bit of cloth. The wind whipped it out flat even as he stared, revealing a green field crossed by a yellow and white flower. 'It's Chalig,' he said, resigned." It is shown in the paperback's profoundly cheesy cover though the illustrator made the flower all-white. There is also a "Red Banner of the Chalig," a quasi-religious item under which the clan is led to war, but no description is given.